Kučić families are Croats and they are mostly from the Island of Cres. In the past century, relatively most of Croatian residents bearing this family name were born in Rijeka and on the Island of Losinj. In places Vidovići and Martinšćica on the Island of Cres every third inhabitant had the family name Kučić. 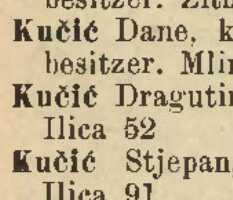 About 530 people with faimily name Kučić live in Croatia today, in 270 households. There were 950 of them in the middle of the past century, and their number decreased by 40 percent. They are located in the most of Croatian counties, in 33 cities and 42 other places, mostly in Mali Losinj on the Island of Losinj (75), Rijeka (70), Cres on the Island of Cres (50), Split (50), and in Zagreb (45). At least 61 families with this surname emigrated from Croatia to: the United States (26), Australia (20), Canada (4), Germany (3), Austria (2), Switzerland (1), Argentina (1), New Zealand (1), Venezuela (1), Sweden (1), and to France (1). Family name Kučić (including: Kucic , Kucich , Kutscheid , Kutschki , Kuchicha , Kutschi , Kuchmich , Kuchic , Kutschia and Kutschin ) is present in 37 countries worldwide. The family name "Kucic " is used by some 400 people in the United States , about 100 in Australia , and some 90 people in Canada. "Kucich " is used by some 200 people in Argentina , about 200 in the United States , and some 70 people in Italy. "Kutschia " is used by small number of people in the United States. In the sources analysed in the project Acta Croatica so far, the name is mentioned over fifty times, the first time 1902 in source Hartmann's General List of Apartments in Zagreb.